You may have heard of Gutenberg or more likely you may have seen mention of it within the WordPress dashboard. WordPress 4.9.8 was the first version of WordPress to ship with the new editor included as an optional feature. So what is it, and why should you care? Let’s dive in and check it out. Gutenberg marks possibly the biggest change ever made to WordPress. It’s a new content editor that looks like it will be the successor to the long-in-the-tooth TinyMCE editor which has been part of WordPress since it was launched. 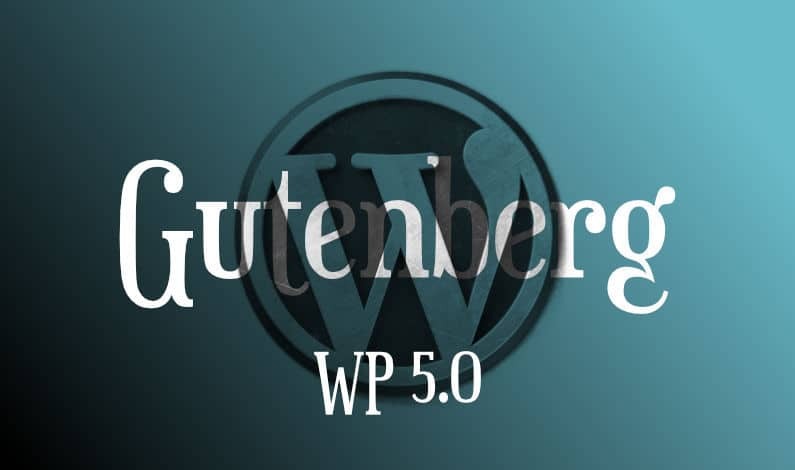 Gutenberg will most likely be launched in WordPress version 5 which is possibly due for release sometime in 2018. Gutenberg is a block-based content editor which means you can visually divide up your content into blocks. A text block here, an image block there, sort them into columns and rows and drag and drop things around to take the guesswork out of laying out your page. It’s a little like Divi but much simpler. It’s come as an answer to competition that abounds from other theme and website creation software that already have more sophisticated content creation tools. Gutenberg is a block-based content editor replacement for the basic WordPress WYSIWYG editor. As you can see, opinions are pretty much weighted to the negative right now and there’s not much of a middle ground. So why is everyone making such a fuss? Well, probably because such a major departure from a simple editor to a block-based builder could create quite a few problems, particularly if it does indeed directly replace the previous content editor rather than being included as an option. Backwards compatibility is a big concern for many WordPress developers who fear that their clients’ sites may become broken overnight. However, Gutenberg is still in beta and although you can use it now, you still have a choice over which editor you use. Also, the developers of Gutenberg appear to be taking a very active approach when listening to criticism and suggestions. I personally think it’ll be very unlikely that they would launch a new content editor with the awareness that it may break many thousands of websites, but I guess we’ll see! What does it mean for Deluxe Web clients? Deluxe Web uses Divi for all our subscription websites, and Elegant Themes (who make Divi) have already implemented a mechanism by which you can choose which editor you use for a page or post. Right now, (although we’re not installing the Gutenberg editor on client sites currently) it could even be more confusing because under the beta rollout, you can choose between the classic editor as well as Gutenberg, and then Divi on top of that. In our tests, this seemed complicated and fiddly as well as confusing, so we’ve left Gutenberg out of the equation for now. If it does indeed replace the existing content editor, it would just be a choice between Gutenberg and Divi, which isn’t so bad, but the trouble with this is they’re much more closely related as page building tools. Even though Gutenberg is a ‘content editor’ rather than a full blown page builder like Divi, it’s still more similar than the outgoing editor and that could make things more confusing for clients with the addition of another learning curve to conquer. So, like most people it seems, we’re hoping that the Gutenberg developers introduce Gutenberg with the option of activating it or not, much like with the current beta. We’re also interested to see how Elegant Themes will shape Divi to work alongside Gutenberg for the optimal editing experience. What are people saying about Gutenberg? Gutenberg is a step forward and an innovative and elegant replacement to the far too simple content editor that WordPress has employed since the year dot. It’s quicker and easier to accomplish a more elegant layout as the tool is more visually representative of how the published page will look. Will provide better tools for layout out content than many themes currently provide. There are likely to be many improvements and additions of functionality that will continually improve the experience over the coming years. Backward compatibility is unclear. If Gutenberg out-and-out replaces the old editor, there are fears that many sites could break. Currently, copying and pasting content (say from a Google Document) doesn’t work well. Many users take this approach to composing content and will be frustrated by the inability to continue in this way. Some just don’t like the new UI or the way it handles HTML coding. Although it’s a content editor, not a page builder, some compare it to page builders and say it comes up short. Generated markup from Gutenberg is not positively received. What positive and negative reviews have in common so far is a desire to leave Gutenberg as an option rather than have it forced upon us. A key consideration for many WordPress developers is in making WordPress simple and intuitive for clients to use, so the ability to choose the right tool for the client is desirable. Compatibility with older plugins and themes is still a huge consideration too. There have been calls to fork WordPress into two versions – a classic and Gutenberg version, or making Gutenberg a part of the Jetpack plugin. Others have stressed the need for a longer transition period which would allow developers of plugins and themes time to update and preserve compatibility. We’ll certainly see how much feedback has been absorbed by the development team when version 5 of WordPress comes along later this year.